A bespoke access solution was provided for a Geotechnical Contractor in a sensitive location to enable ground investigation tests and directional borehole drilling. This project forms part of the ground investigation framework for HS2 with site investigations (SI) being undertaken to demanding standards. Providing vital ground engineering and design data for the construction of bridges, tunnels, cuttings and four new stations, as well as 140 linear miles of rail carrying trains at up to 250 mph. The total hire duration ran until early 2018. The installation was carried out over two weeks, with many factors to consider such as environamental, neighbourhood, ecological as well as ensuring little impact was caused to the members of the golf club. The panels were installed in two main areas; the driving range and across the golf club. 151 HD panels were installed over the course of four days. Due to the tight access point, a telehandler from UK Folks was used by TPA operatives who completed this in a 3 hour window each day to work on the driving range before opening to public. PVC matting was installed along the edge of the panels to ensure miscued golf balls which may hit the panels side on would be safety deflected away from coming back towards the golfer. Across the main golf course, 914 of TPA's HD aluminium panels were installed using the TPA installation vehicles (HGV HIAB) and at four locations (small stream points). Vp plc's Groundforce Bridge division was on site throughout TPA's installation period installing 4x temporary bridges. TPA installed the MaxiTrack system an innovative approach to temporary ground protection. The lightweight 40kg mats can easily be handled by two workers without the need for specialist lifting equipment or expensive crane hire. 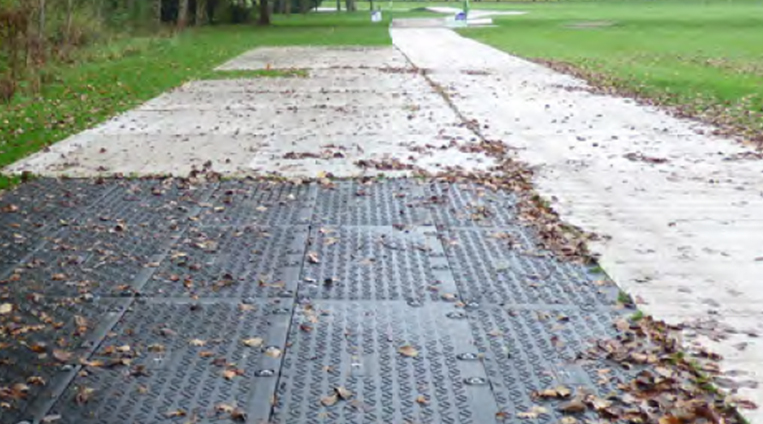 These mats are extremely heavy duty and incredibly strong, able to support huge loads up to 130 tonnes. MaxiTrack mats can be kept joined in fours, and craned into position as 3.6x1.8 metre mats. The driving range was installed with 151 HD panels over a four day period. Due to limited access and a short 3 hour window for our operatives to lay the panels before opening for public use. Additionally PVC matting was installed along the edge of the panels to ensure the safety of the players against golf balls hitting the edge of the pannels.